NCERT Solutions for Class 10 Math Chapter 14 Statistics are provided here with simple step-by-step explanations. These solutions for Statistics are extremely popular among class 10 students for Math Statistics Solutions come handy for quickly completing your homework and preparing for exams. All questions and answers from the NCERT Book of class 10 Math Chapter 14 are provided here for you for free. You will also love the ad-free experience on Meritnation’s NCERT Solutions. All NCERT Solutions for class 10 Math are prepared by experts and are 100% accurate. A survey was conducted by a group of students as a part of their environment awareness programme, in which they collected the following data regarding the number of plants in 20 houses in a locality. Find the mean number of plants per house. Which method did you use for finding the mean, and why? To find the class mark (xi) for each interval, the following relation is used. xi and fixi can be calculated as follows. Therefore, mean number of plants per house is 8.1. Here, direct method has been used as the values of class marks (xi) and fi are small. Consider the following distribution of daily wages of 50 worker of a factory. Find the mean daily wages of the workers of the factory by using an appropriate method. To find the class mark for each interval, the following relation is used. Taking 150 as assured mean (a), di, ui, and fiui can be calculated as follows. Therefore, the mean daily wage of the workers of the factory is Rs 145.20. The following distribution shows the daily pocket allowance of children of a locality. The mean pocket allowance is Rs.18. Find the missing frequency f.
Taking 18 as assured mean (a), di and fidi are calculated as follows. Hence, the missing frequency, f, is 20. Thirty women were examined in a hospital by a doctor and the number of heart beats per minute were recorded and summarized as follows. Fine the mean heart beats per minute for these women, choosing a suitable method. To find the class mark of each interval (xi), the following relation is used. Taking 75.5 as assumed mean (a), di, ui, fiui are calculated as follows. Therefore, mean hear beats per minute for these women are 75.9 beats per minute. In a retail market, fruit vendors were selling mangoes kept in packing boxes. These boxes contained varying number of mangoes. The following was the distribution of mangoes according to the number of boxes. Find the mean number of mangoes kept in a packing box. Which method of finding the mean did you choose? It can be observed that class intervals are not continuous. There is a gap of 1 between two class intervals. Therefore, has to be added to the upper class limit and has to be subtracted from the lower class limit of each interval. Class mark (xi) can be obtained by using the following relation. Taking 57 as assumed mean (a), di, ui, fiui are calculated as follows. Mean number of mangoes kept in a packing box is 57.19. Step deviation method is used here as the values of fi, di are big and also, there is a common multiple between all di. The table below shows the daily expenditure on food of 25 households in a locality. Find the mean daily expenditure on food by a suitable method. Taking 225 as assumed mean (a), di, ui, fiui are calculated as follows. Therefore, mean daily expenditure on food is Rs 211. Find the mean concentration of SO2 in the air. To find the class marks for each interval, the following relation is used. Taking 0.14 as assumed mean (a), di, ui, fiui are calculated as follows. Therefore, mean concentration of SO2 in the air is 0.099 ppm. A class teacher has the following absentee record of 40 students of a class for the whole term. Find the mean number of days a student was absent. To find the class mark of each interval, the following relation is used. Taking 17 as assumed mean (a), di and fidi are calculated as follows. Therefore, the mean number of days is 12.48 days for which a student was absent. The following table gives the literacy rate (in percentage) of 35 cities. Find the mean literacy rate. To find the class marks, the following relation is used. Taking 70 as assumed mean (a), di, ui, and fiui are calculated as follows. Therefore, mean literacy rate is 69.43%. To find the class marks (xi), the following relation is used. Taking 30 as assumed mean (a), di and fidiare calculated as follows. Mean of this data is 35.38. It represents that on an average, the age of a patient admitted to hospital was 35.38 years. 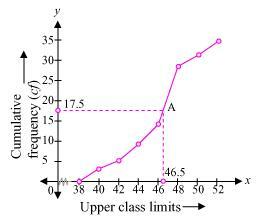 It can be observed that the maximum class frequency is 23 belonging to class interval 35 − 45. Mode is 36.8. It represents that the age of maximum number of patients admitted in hospital was 36.8 years. From the data given above, it can be observed that the maximum class frequency is 61, belonging to class interval 60 − 80. The following data gives the distribution of total monthly household expenditure of 200 families of a village. Find the modal monthly expenditure of the families. Also, find the mean monthly expenditure. It can be observed from the given data that the maximum class frequency is 40, belonging to 1500 − 2000 intervals. Therefore, modal monthly expenditure was Rs 1847.83. To find the class mark, the following relation is used. Taking 2750 as assumed mean (a), di, ui, and fiuiare calculated as follows. Therefore, mean monthly expenditure was Rs 2662.50. The following distribution gives the state-wise teacher-student ratio in higher secondary schools of India. Find the mode and mean of this data. Interpret the two measures. It can be observed from the given data that the maximum class frequency is 10 belonging to class interval 30 − 35. It represents that most of the states/U.T have a teacher-student ratio as 30.6. Taking 32.5 as assumed mean (a), di, ui, and fiui are calculated as follows. Therefore, mean of the data is 29.2. It represents that on an average, teacher−student ratio was 29.2. The given distribution shows the number of runs scored by some top batsmen of the world in one-day international cricket matches. From the given data, it can be observed that the maximum class frequency is 18, belonging to class interval 4000 − 5000. Therefore, mode of the given data is 4608.7 runs. From the given data, it can be observed that the maximum class frequency is 20, belonging to 40 − 50 class intervals. Therefore, mode of this data is 44.7 cars. The following frequency distribution gives the monthly consumption of electricity of 68 consumers of a locality. Find the median, mean and mode of the data and compare them. Taking 135 as assumed mean (a), di, ui, fiui are calculated according to step deviation method as follows. From the table, it can be observed that the maximum class frequency is 20, belonging to class interval 125 − 145. To find the median of the given data, cumulative frequency is calculated as follows. Cumulative frequency (cf) just greater than is 42, belonging to interval 125 − 145. Therefore, median, mode, mean of the given data is 137, 135.76, and 137.05 respectively. The three measures are approximately the same in this case. If the median of the distribution is given below is 28.5, find the values of x and y. The cumulative frequency for the given data is calculated as follows. Median of the data is given as 28.5 which lies in interval 20 − 30. Hence, the values of x and y are 8 and 7 respectively. A life insurance agent found the following data for distribution of ages of 100 policy holders. Calculate the median age, if policies are given only to persons having age 18 years onwards but less than 60 year. Here, class width is not the same. There is no requirement of adjusting the frequencies according to class intervals. 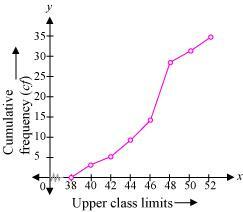 The given frequency table is of less than type represented with upper class limits. The policies were given only to persons with age 18 years onwards but less than 60 years. 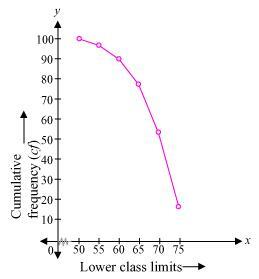 Therefore, class intervals with their respective cumulative frequency can be defined as below. From the table, it can be observed that n = 100. Cumulative frequency (cf) just greater than is 78, belonging to interval 35 − 40. Therefore, median age is 35.76 years. Find the median length of the leaves. The given data does not have continuous class intervals. It can be observed that the difference between two class intervals is 1. Therefore, has to be added and subtracted to upper class limits and lower class limits respectively. Continuous class intervals with respective cumulative frequencies can be represented as follows. From the table, it can be observed that the cumulative frequency just greater than is 29, belonging to class interval 144.5 − 153.5. Therefore, median length of leaves is 146.75 mm. Find the median life time of a lamp. Thecumulative frequencies with their respective class intervals are as follows. It can be observed that the cumulative frequency just greater than is 216, belonging to class interval 3000 − 3500. Therefore, median life time of lamps is 3406.98 hours. Determine the median number of letters in the surnames. Find the mean number of letters in the surnames? Also, find the modal size of the surnames. The cumulative frequencies with their respective class intervals are as follows. It can be observed that the cumulative frequency just greater than is 76, belonging to class interval 7 − 10. To find the class marks of the given class intervals, the following relation is used. Taking 11.5 as assumed mean (a), di, ui, and fiui are calculated according to step deviation method as follows. From the table, it can be observed that the maximum class frequency is 40 belonging to class interval 7 − 10. Therefore, median number and mean number of letters in surnames is 8.05 and 8.32 respectively while modal size of surnames is 7.88. The distribution below gives the weights of 30 students of a class. Find the median weight of the students. Cumulative frequency just greater than is 19, belonging to class interval 55 − 60. Therefore, median weight is 56.67 kg. The following distribution gives the daily income of 50 workers of a factory. Convert the distribution above to a less than type cumulative frequency distribution, and draw its ogive. The frequency distribution table of less than type is as follows. 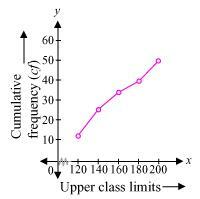 Taking upper class limits of class intervals on x-axis and their respective frequencies on y-axis, its ogive can be drawn as follows. Draw a less than type ogive for the given data. Hence obtain the median weight from the graph verify the result by using the formula. Taking upper class limits on x-axis and their respective cumulative frequencies on y-axis, its ogive can be drawn as follows. Mark the point A whose ordinate is 17.5 and its x-coordinate is 46.5. Therefore, median of this data is 46.5. It can be observed that the difference between two consecutive upper class limits is 2. The class marks with their respective frequencies are obtained as below. The cumulative frequency just greater than is 28, belonging to class interval 46 − 48. Therefore, median of this data is 46.5. Hence, the value of median is verified. The following table gives production yield per hectare of wheat of 100 farms of a village. Change the distribution to a more than type distribution and draw ogive. The cumulative frequency distribution of more than type can be obtained as follows. Taking the lower class limits on x-axis and their respective cumulative frequencies on y-axis, its ogive can be obtained as follows.